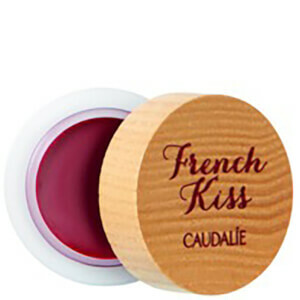 Condition and protect skin from the cold weather with the Thé des Vignes Lip & Hand Duo from Caudalie. Housed in a pouch, the travel-size kit is delicately fragranced with the brand's Thé de Vigne scent of orange blossom and jasmine, combined with notes of sensuous white musk and warming ginger. The perfect rescue pack for yourself or loved one. Transform dry, hard-working hands with this fragranced hand cream. Fast-absorbing, the cream delivers hydration for long-lasing softness, without leaving skin greasy. Nourishes skin and repairs damage and roughness caused by environmental aggressors, revealing smooth, supple and deeply moisturised hands. Rejuvenates and conditions the cuticles and nails to restore healthy-looking fingertips. Formulated with 99.5% naturally-derived ingredients, this Lip Conditioner is a beauty treatment that repairs damaged lips with each application. Delivers antioxidant protection and nourishes skin for long-lasting hydration, whilst delicately fragrancing lips with a luxurious vanilla scent. This lip balm is an old favourite, leaves a light sheen and is mildly scented, emollient and no strange taste. I would love it if they have an SPF version too. I'm a fan of Caudalie original hand cream and this version is just as good - hydrating and doesn't leave a film on my hands. The scent is much stronger than the original, definitely more musky and floral. this duo is value for money. the lip balm is moisturizing and the hand cream is not sticky.